The Lightning Lounge: Is Talbot worth the price for the Oilers? There was a report out earlier today that my hometown Edmonton Oilers are willing to give up the 16th overall pick in this year’s draft in exchange for New York Rangers goaltender Cam Talbot. It’s pretty clear that Edmonton has made acquiring a number one goaltender its highest priority heading into the offseason. That’s not really a surprise when you consider how the tandem of Ben Scrivens and Viktor Fasth performed last year. Still, it’s hard to imagine that any goaltender will be able to fix the Oilers’ fortunes unless they go out and get some defensive help. Connor McDavid doesn’t play on the blue line, does he? But, I digress. The first three years shown on that chart (2010-2013) are from Talbot's years in the American Hockey League. Yes, there was improvement. No, he was never a .920+ goaltender. What are the odds that a guy who never hit that mark in the AHL hits it in Edmonton, a place where there's basically an AHL-quality defense. 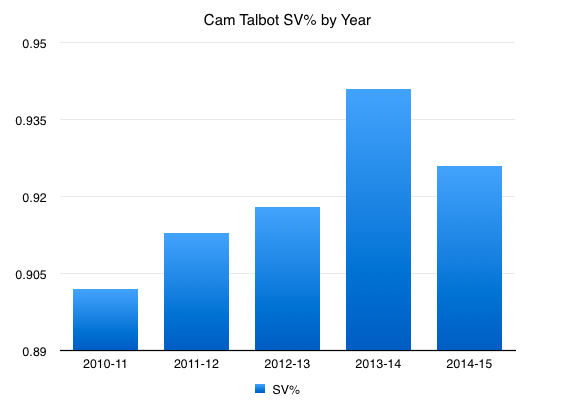 I think it's quite likely that Talbot experienced a bump in performance while playing behind New York's stingy defense. And it's not like his sample size as a supposedly 'elite' goaltender is overly large, either. 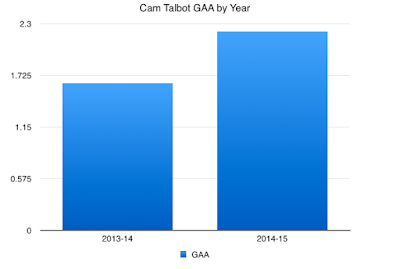 As mentioned, if a Talbot deal happens, it wouldn't be the first time that Edmonton has been sucked in by a goaltender's past performance behind a great team. Fasth was coming off a 2013 season in which he posted a .921SV% when Edmonton acquired him. Scrivens was a .931 guy in Los Angeles when the Oilers pulled the trigger on a trade for him. Both floundered in Edmonton. It's almost like a goaltender can look better behind a solid team. 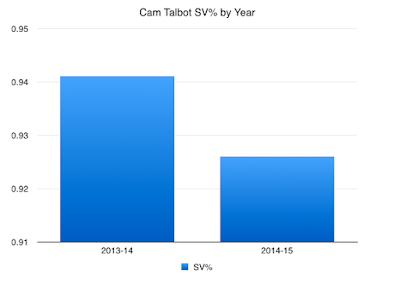 Now, none of this is to say that Talbot can't or wouldn't be a good player for the Oilers. He's clearly capable of making saves. He could be the guy who fixes their crease issues for the next decade. At the same time, though, there's a certain element of risk that comes with potentially acquiring an almost 28-year-old goalie who really hasn't proven a whole ton in the NHL. Remember when Steve Yzerman acquired Ben Bishop from the Ottawa Senators? He gave up a player who didn't fit into the team's long-term plans, and who hasn't been able to stick in the NHL since. A mid-first round pick in one of the deepest NHL drafts in recent memory, on the other hand, seems like a steep price to pay for a relative unknown. The New Jersey Devils gave up the 9th overall pick for Cory Schneider two summers ago, but his NHL resume was larger than Talbot's at the time. Are they comparable? I guess that's for Edmonton to decide.